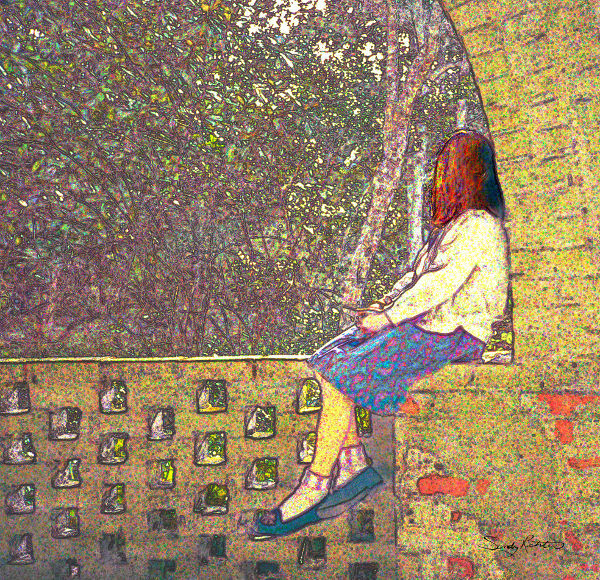 My artwork entitled “Day Dreamer” has special meaning for me; a portrait of my daughter, a young girl in quiet contemplation, transporting herself somewhere else, in place, in time, in imagination. I love to day dream, it’s a trait I cherish, and it helps me with my art creations. I wanted to express this in the artwork; the magic and wonder that is felt in a day dream. I get this feeling when I thumb through a classic storybook that I remember from childhood, which led me to choose a vintage illustrative quality for this work. I wanted to set the scene of a girl as heroine in a book in the first chapter of the story, where she gazes off into the distance, moments before the day dream magic starts, transporting her to another world; a metaphor for a moment of peace, tranquility, and meditation, before life propels us forward into new adventures and possibilities.